The commodes consists of an original black fossil marble top above an overhanging frieze drawer with laurel wreath ormolu decoration to each side, supported by tapering turned columns with ormolu collars to the top and bottom. 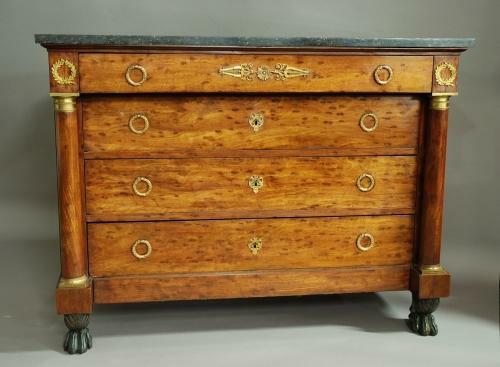 The four drawer fronts are veneered with plum pudding mahogany with chestnut linings. The frieze drawer having a central ormolu embellishment with wreath design ormolu handles, the three drawers below having identical ormolu handles with central ormolu decorative escutcheon plates. The commode is supported on ebonised paw feet to the front with block feet to the back and the side panels are straight grain mahogany. This piece is in good original condition, of stable construction and can go straight into a home.